On Saturday I went on the first performance of a new guided walk from the writers of The Thin Veil of London, which was both the title of a walk and a book. Led by Robert Kingham of Minimum Labyrinth, I was one of a group taken on a tour of The Pantheon of Pancras. 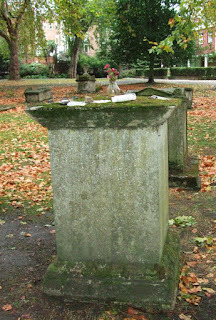 The old Parish of St Pancras is home to one of the earliest sites of Christian worship in London, and the largest single biomedical laboratory in Europe. It is the location of one of the biggest regeneration projects in Europe; and it has had a long and notorious relationship with the oldest profession... St Pancras exists on what was the edge of London. It also has attracted those on the edge of society: outsiders who have disrupted time, and space, and the way we see the world. On this walk through Georgian squares, down secluded footpaths and along canal towpaths, you will hear about some of these people, together with the old and new gods that they have deemed worthy of worship. I will mention two of my own favourite parts of the walk. One of the early stopping points is St George's Gardens. 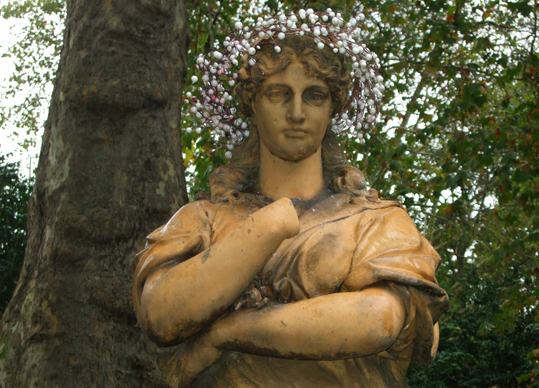 This contains a statue of Euterpe, the Muse of lyric poetry. In my photo at the top of this post you can she is wearing a new crown. According to one of my fellow walkers who lives in the area, her crown is regularly renewed or sometimes replaced with garlands of flowers. This ancient Goddess is still honoured here. 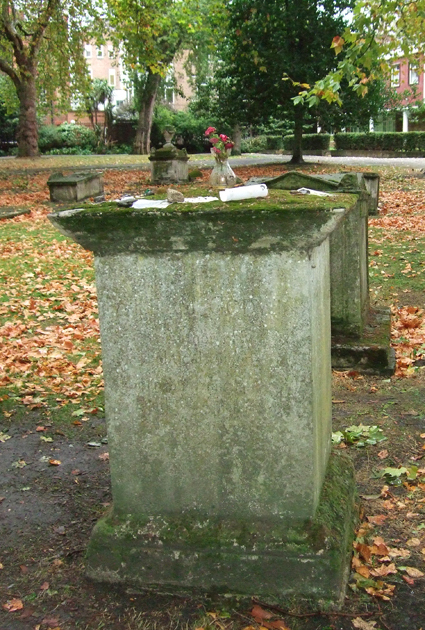 Offerings are also still left at the tomb of Mary Wollstonecraft, early advocate of women's rights, who is buried at St Pancras Old Church. You can see that in the photo to the right. Although Saturday was wet and cold, The Pantheon of Pancras was a fantastic walk on which I learnt a huge amount, met up with some old friends made new ones. I visited corners of London I had not known about before and also revisited some of my favourite sites - including the Hardy Tree, also in the grounds of St Pancras Old Church. St George's Gardens is one of my favourite places in London. I used to work on Grays Inn Road and it was my place to escape to at lunchtime. So peaceful!